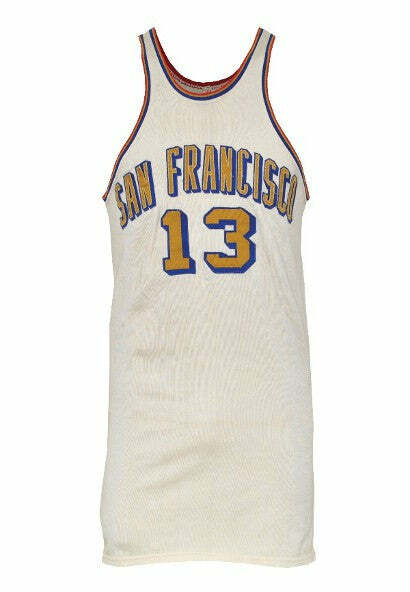 A game used jersey worn by Wilt Chamberlain for the San Francisco Warriors saw the highest bids in Grey Flannel Auctions' 8th Annual Hall of Fame Induction Auction, held on September 9 at the Naismith Memorabilia Basketball Hall of Fame in Springfield, Massachusetts. The jersey was an unexpected highlight of the sale, coming in at $78,000 against a minimum bid of just $10,000. It is the only home jersey of the style ever seen by the auction house, and is therefore exceedingly rare. Wilt "The Stilt" Chamberlain (1936-1999) played for the Philadelphia/San Francisco Warriors between 1959 and 1965, before moving to the Philadelphia 76ers and later, the Los Angeles Lakers. He is considered one of the greatest players in NBA history, being the only player to score 100 points in a single game and average more than 40-50 points a season. In 1996, he was voted one of the top 50 NBA players of all time. The remainder of the auction was dominated by an astonishing collection of Jerry Lucas' career memorabilia, consigned by the man himself, which was headlined by his 1973 New York Knicks World Championship ring at $72,000. Following was Lucas' 1960 Olympic Games jersey, which he wore to secure the gold medal for the USA against Brazil, scoring 25 points as the unexpected star of the final game. It made $60,000, accompanied by a handwritten letter from Lucas himself. "Things don't mean a lot to me," Lucas told the Middletown Journal. "They never have. I have real great memories associated with them, but they're hard to see when they're in a closet." See our fantastic selection of sports memorabilia for sale for the latest addition to your collection.